Healthper, Inc., a fast rising social game-based health engagement platform is changing how we manage our total health and wellness. 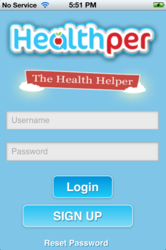 Healthper has created a fun and engaging mobile application that is designed to take the “work” out of health reporting. “The Android application is another milestone as we make our offering more robust and accessible,” said John Hammitt, President of Healthper. Healthper, Inc., a social game-based health engagement and achievement platform, announced today the launch of a mobile application for Android users: Healthper/Android. Healthper helps people accomplish simple daily actions to maintain a healthy lifestyle, create stories about their achievements, share those stories and get rewarded. Healthper members can track their progress through detailed monthly reports, create goals, invite friends to join their journey and, best of all, manage their total health in one place. Healthper allows members to customize their “Healthdeck” by engaging in healthy game play, goal setting and interaction with community members via a portal exchange. Healthper’s new mobile application is designed to motivate and guide users through a personalized and rewarding experience. Members can chat one-on-one with Health Helpers, friends, family and colleagues, post questions, comments or respond to others in the community and encourage with goals and milestones. Developed by the former team from CareGain that helped create Health Savings Accounts (HSAs), Healthper is not only a game, it is an extensive and flexible health engagement platform designed to create real value for individuals and their health plans. Healthper is a privately held company based in Princeton, NJ. For more information, please visit: http://www.healthper.com.